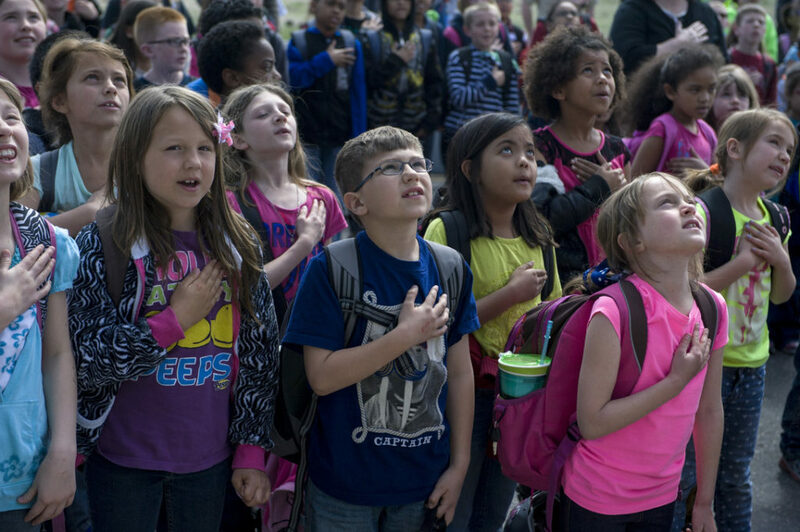 Beginning each public school day with the Pledge of Allegiance forces non-theistic children to either acknowledge God or stand out as a protestor. The current language of the Pledge of Allegiance as written in our Federal laws states: “I pledge allegiance to the Flag of the United States of America, and to the Republic for which it stands, one Nation under God, indivisible, with liberty and justice for all.”(1) Forty-four states have laws that require public school classes recite the Pledge of Allegiance or mandates to the school districts to set aside time for recitation. (2) Three of the six states without these laws have bills in their legislature to add required recitation. (3) If a child attends public school from Kindergarten through 12th grade, they hear that we are a nation under God 2,320 times. (4) Although the Supreme Court said students cannot be required to recite the Pledge of Allegiance in violation of a sincerely held religious belief,(5) a daily recitation declaring that the nation is “under God” forces non-theistic students to either deny or speak out on their religious beliefs, exposing them to bias and judgment. The social and political perils of public school identify non-theistic students as peers to be questioned and possibly ostracized. This forces them to choose to violate their beliefs about God to fit it, or stand as a protestor. Reciting the Pledge of Allegiance cannot be a truly patriotic exercise while its words violate one of the founding principles of our Constitution. Federal and state statutes proclaiming the United States of America a “Nation under God” violate the Establishment Clause of the First Amendment to the U.S. Constitution as a government endorsement of religion. When actions on behalf of non-theistic students are brought before federal courts, most hold that the reference to God does not convert the Pledge from a patriotic exercise to a religious activity. (6) While the Supreme Court has not ruled specifically on the constitutionality of including “under God” in the pledge,(7) they have held that the government may not favor religious belief over disbelief. (8) State laws directing public schools are clear actions of the government and as such, should not favor belief in God. Congress cited the history of the Pledge of Allegiance and references to God when both the House and Senate approved Public Law 107-293 in 2002, a reaffirmation of the Pledge of Allegiance containing the phrase “under God.”(9) However, neither the original version of the Pledge of Allegiance, written in 1892 by Francis Bellamy,(10) nor the version Congress recognized in 1942 as the official national pledge of the United States, contained any reference to God.”(11) “Under God” was added to the Pledge of Allegiance in 1954(12) after the Knights of Columbus, the world’s largest Roman Catholic fraternal organization,(13) persuaded members of both houses of Congress that the suggested religious exercise may combat the threat of communism. (14) Congress left the original versions of the Pledge and their reasons for changing it out of their reaffirmation’s historical findings. The inclusion of “under God” in the patriotic school exercise of reciting the Pledge of Allegiance isolates students who question the existence of God. Children are coerced into compliance or forced to protest this unconstitutional, unhistorical, and unnecessary divine reference. Non-theistic children are entitled to a public education without daily disparagement of their religious beliefs. The Secular Coalition for America believes the words “under God” should be removed from the Pledge of Allegiance. (5) West Virginia State Board of Education v. Barnette, 319 U.S. 624 (1943). The Court declared that recitation of the pledge violated the First Amendment rights of students who were members of the Jehovah’s Witnesses. (6) Freedom from Religion Found. V. Hanover Sch. Dist., 626 F.3d 1 (1st Cir. 2010); Croft v. Perry, 624 F.3d 15 (5th Circ. 2010); Myers v. Loudoun County Pub. Schs., 418 F.3d 395 (4th Cir. 2005); Sherman v. Cmty. Consol. Sch.Dist., 980 F.2d 437 (7th Circ. 1992). (8) County of Allegheny v. ACLU, 492 U.S. 573, 593 (1989). (10) Baer, John. The Pledge of Allegiance, A Revised History and Analysis, Annapolis, Md. Free State Press, Inc., 2007.